Pot Magnet with Bore This is an example of magnets we can manufacture. 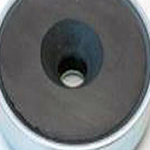 A flat pot magnet with bore and counterbore. Galvanised body, with ferrite magnetic core.